With all the buzz about social media, it’s easy to forget that offline media attention can be equally valuable, especially for community-based nonprofits who want to get attention to local projects or recruit local members and volunteers. Offline media attention is good. Getting it can be hard, however, in the digital information age. Challenged by online alternative news sources, print newspapers are slimming down, cutting pages to cut their costs. To save on staff, newspapers increasingly bypass firsthand reportage and go the easy route — wire service stories and syndicated features that can go straight from digital file to layout software to printing department to newsstand. It’s a simple matter of economics. Local newspapers — often weekly supplements to major newspapers, designed primarily to deliver advertising to a specific local market — can be the best bet for nonprofits. Community-based newspapers need stories to wrap around the advertising that’s their lifeblood, but they have precious few resources for going out and digging up those stories from scratch. And community-based nonprofits, by their very nature, are a particularly good source for this sort of content, because your members and volunteers are the paper’s own readers, or their friends and neighbors. That's what the small local papers are all about. How can a nonprofit make it easy for local newspapers to run its stories? Get familiar with the publication. What kind of stories do they normally run? Press releases and handshake photos with brief captions, or human-interest features about local personalities? Build a relationship with a reporter. Rather than send your materials ‘over the transom’ to the editor’s attention, check back issues of the newspaper for local stories like your own and take note of who has written them. Establishing a relationship with one or two individuals at the paper can sometimes win you a champion when it comes to pitching stories. Get to the point of your pitch. Reporters and editors are always, always, always pressed for time, so prepare ahead of time, know exactly what you’re looking for (both what the minimum coverage is likely to be and what, in an ideal world, you’d love to have happen), and get to the point. If you phone up with a long rambling introduction to your organization, working towards asking for “a story on our event” you’re likely to get short shrift unless you’ve got a wowser of an opening line. Better, ask how to go about submitting an item to the Local Events Calendar or some other specific column. That’s your foot in the door. Never mind the DIY public relations advice about reverse pyramid structure and press release formats, when you’re dealing with the local weeklies; hook them with a story that will practically write itself. Talk about the Boy Scout who peels potatoes at the soup kitchen on weekends, or the local celebrity who promised to paint his face green if his colleagues can meet your fundraising target. If you’ve got a one-sentence “elevator pitch” that immediately plants a picture in the reporter’s mind, you’ve got a great shot at getting into print. What kinds of coverage are planned in advance? How much lead time does the paper generally require? Are they likely to print your story on shorter notice if it is submitted in publishable form, rather than pitched as a story idea only or submitted as a press release? Does the paper have regular features or special seasonal issues that fit in with your nonprofit’s schedule of activities, events and fundraising campaigns? Local newspapers will often take an easy story over one that requires a lot of legwork. What work can you do on your end to make it easier for the reporter, editor, and layout department? Do provide a collection of backgrounders, artwork (photographs, logos, and other graphic elements to accompany your story), quotable interviews with key individuals, maps, contacts for more information, and whatever other assets might help to tell your story. What tips would you add to this list, for small nonprofits looking to get some local newspaper coverage? As you note, community newspapers are often short on stories and open to a pitch. Years ago I developed a weekly health column for a local paper for the organization I was working with. The actual writing took 30-60 minutes a week but the exposure was invaluable. Community newspapers are also great places to highlight your volunteers. With our world expanding so rapidly via the Internet and social media, it pays to stay on top of "old" methods too. You want to engage your donors where they live and, while it might not seem like it to us, everyone is not online 24/7 :). Thanks for the post and practical advice. This was the first-time I have heard of matching your photo shoots to the style/poses/etc that a particular newspaper prefers. Have you---or anyone else---had any luck with online news resources like Helpareporter.com? 1. Offer a visual element to the story, link to a YouTube video or offer high-resolution images. Stories aren't only told in words, even for print papers. 2. Keep in consistent contact with the reporter whom you know. Don't pester, but drop in a note with a quick update on what you are achieving and ask how you can be of help to any stories they are working on. 3. Be a reliable resouce. Try to help a reporter by being a link or source of good resources for their beat. 4. Thank the reporter after the story runs, let them know if it had an impact. E.g. we had a spike in phone calls to donate after your article ran last week which let us help 5 more families in the community. 5. Put your basic press info on your website, including visuals. While most reporters won't keep paper media kits, they will want to have access to your most basic information quickly. Pamela and CloudSpark, thanks for adding your tips - good stuff there! Great suggestions, local coverage is pretty easy to get if you know the right people. 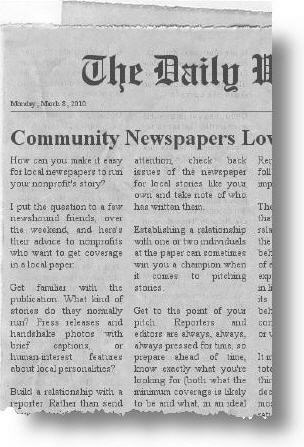 Writing columns for the local paper is also a great way to get noticed. Great advice for the average small business owner. I myself own a Internet marketing company that focuses on local marketing for small businesses and I too admit the fact that too many companies are falling for the digital hype and are forgetting the essential benefits of print media. Become a source for reporters. Pitch stories about your group, but also keep reporters apprised of news in their beat even when it doesn't directly refer to your organization. Reporters will seek you out if they find that you have information that helps them keep informed. Great tips - thanks, all! And, Barry, you bring up a particularly important (and effective) technique I'm kicking myself for not having in the blog post - becoming a reliable information source, rather than simply a purveyor of your organization's own stories. As the saying goes, "give to get"!